Every maker has a story. Be a part of Rustic Wood Creations's story by placing an order, leaving a review, and seeing your review appear here. This loveseat style from bygone days accommodates two "lovers" sitting face to face. The deeple contoured seat is comprised of Spalted Maple. The arches are cedar and maple. Dogwood, hazelnut, locust, walnut and melaleuca make up the infill, legs and cross members. The two end armrests are contorted filbert. 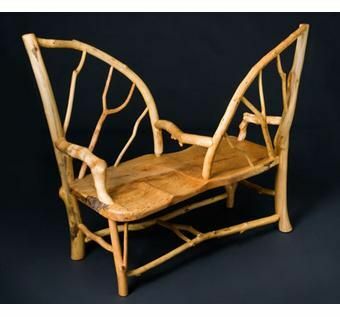 Price range for custom "lovers seat", depending on design and complexity: $1600-$2400.